John Webber was official artist to Captain James Cook on Cook’s third and final voyage to the Pacific on the Resolution from 1776. His task was to provide topographical drawings as well as illustrations of the people, animals and plants they encountered. His 1783 painting A view of Otaheite Peha is one of a number of works he made of the Tahitian landscape. Tahiti held popular appeal in 18th-century Britain as a distant, exotic and idyllic land, and Webber’s paintings fuelled these Western myths. 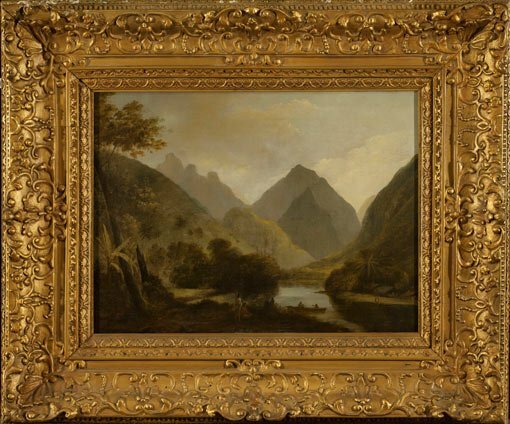 He combined imagery from the voyage with idealised elements of British pastoral painting to give an impression of majestic mountains standing guard over the blissful existence of the indigenous people below. 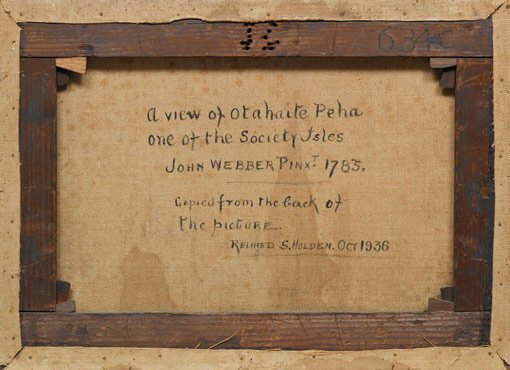 A view of Otaheite Peha is the only painting of Cook’s voyages in the Art Gallery of NSW collection. While not an Australian subject, the painting has great significance. It beautifully demonstrates how artistic imagination was used in the service of scientific enquiry in these early encounters between Europeans and the places and people of the Pacific. It also gives us a glimpse of the aesthetic principles and ideologies that served in picturing the 'new worlds’ of the Pacific and that would later influence 19th-century Australian art. Unfortunately, the condition of A view of Otaheite Peha has, for a number of years, made this work unexhibitable. Last conserved in 1936, the painting is in poor condition with darkened varnish layers and discoloured restorations that obscure the light-filled sky and make details in the foreground difficult to see. An original inscription by the artist was noted by the 1936 restorer but is now covered by a canvas lining. If we remove the lining, we’ll be able to see and authenticate the inscription. The carved 18th-century frame has been covered with bronze paint obscuring the original gilded finish, so it too requires treatment.